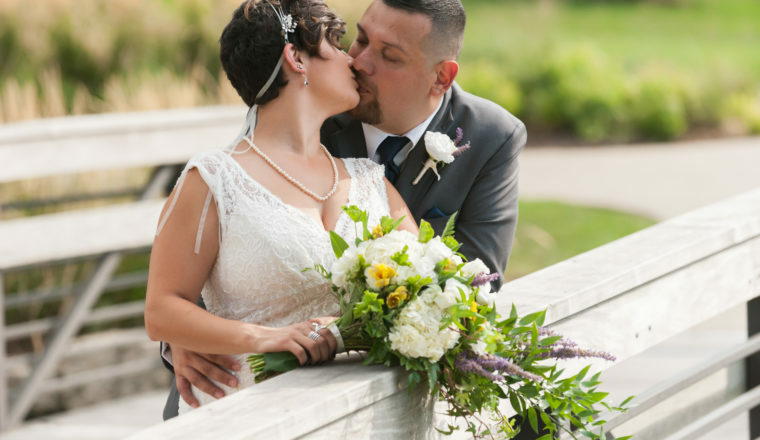 Sarah and Roberto had a beautiful outdoor ceremony and reception at the Westin Chicago Northwest Itasca. Sarah’s non-traditional cascade was absolutely stunning! It featured white hydrangeas, blue veronica, alstomeria, lisianthus and soft cascading foliage. Sarah’s bridesmaids, dressed in Navy, had bouquets featuring white hydrangeas, green fuji mums and blue delphinium. Sarah and Roberto’s centerpiece featured a beautiful combination of white hydrangeas, blue delphinium, green button mums , sunflowers and alstromeria! Thank you to Modern Image Studios for the images!